Elite medallist Jack Clarkson topped a successful 48 hours for Calderdale riders at the National Cyclo-Cross Championships, that took place in Shrewsbury over the weekend. Hope Factory Racing’s Clarkson, from West Vale, was riding his first Elite Men’s championships after graduating from the under-23s category and quickly moved into third place behind Olympic mountain biker Liam Killeen and the defending champion, Ian Field. Clarkson, 22, shadowed this leaders for much of the race without quite being able to get up to them. Then, in the final laps he came under pressure from David Fletcher and former champion Nick Craig. Fletcher looked set to make contact with just over a lap to go, only to suffer a serious mechanical problem, which dropped him to ninth. Although clearly at his limit, Clarkson powered round that last lap of the 2.5km course in great style to hold off Craig and claim a well-deserved bronze medal. It was a career-best ride at National level by Clarkson, who clearly enjoyed a very muddy course that required almost as much running with and carrying of the bike as actual cycling. 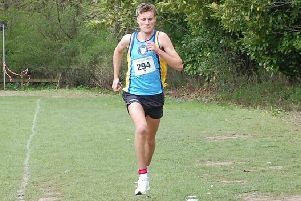 “It was a tough day out, that’s for sure,” said the former Brooksbank School pupil, who was due to find out this week whether he had secured Great Britain selection for his first senior World Championships. “I’ve been focusing on getting a good result at nationals all year, so to deliver that in my first year as an elite is really pleasing. “There was a lot of running, which probably helped me, but generally I have upped my game this year as far as both racing and preparation goes. “I’ve done a bit more training and structured it a bit more, but I think some of it is just that natural strength you develop as you get older. Earlier, Chris Young of the Halifax based Pedalsport club won a silver medal in the Over-50 race after a brave ride that saw him almost chase down eventual winner, the former World Cup mountain biker Tim Gould, who had built up a big lead in the opening lap. The Pedalsport Club also had several Youth (under-16) riders in action, with Max Rushby finishing an impressive 15th on his National Championships debut, with team-mates Finlay Cooper-Oldroyd and Joe Coukham also making the top 50 with solid rides. The club’s youngest competitor was Olivia Ingham, who celebrated her 14th birthday by finishing 14th in the Under-14 Girl’s race, another strong debut in the event. The Championships look set to return to West Yorkshire and Bradford’s Peel Park in January 2016.